What does "Buyer's Best" mean? On select products, our buyers have used The Brick's purchasing power to get you the best quality products for the best prices in Canada. Our buyers have done their homework and pulled strings to get you the best quality products for the best prices in Canada. Our Buyer's Best products are at a low price you can count on every day – no promotional end dates and no confusing terms. That's why these items can't be combined with our other promotions. 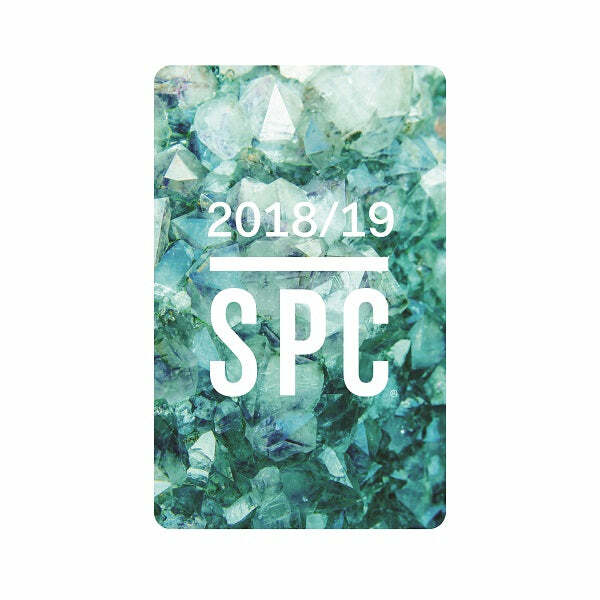 A. SPC (Student Price Card) is a loyalty program specifically for students that gives them access to discounts and deals at thousands of the best stores and restaurants across Canada. Users may have a physical card, or they can use the SPC app. Q. Who is eligible for the SPC Card? A. Membership is limited to those individuals enrolled in a recognized Canadian institution who are able to provide a valid piece of student identification. Q. How much is the SPC Card? A. The year long membership is only $10. A. 2018/2019 memberships are valid from August 1, 2018 until July 31, 2019. Q. What are the offers we're providing students with the SPC Card? A. Get $50 off your furniture or mattress purchase of $499 or more. Excludes limited time offers and limited quantity items. Valid student ID must be presented to receive discount. Q. Where can I enroll in the SPC Card program? A. All stores including Brick Mattress Stores and The Brick Outlet are part of the SPC Card program. You can use or purchase an SPC Card at any location when you present a valid piece of student ID. Please visit your nearest Brick store as we are unable to offer this program online. Special Order products are items we don't stock in our warehouses as regular inventory. When you purchase a Special Order product, we specially order the product(s) directly from the manufacturer. These products are made to your specifications so the availability dates are often further out than for items we regularly stock. Since estimated arrival dates can vary according to the product, our sales consultants at your local Brick store can help give you the best estimated date of arrival for Special Order items. All Special Order products must be paid in full before we can place the order with the manufacturer. Once the products are shipped from the manufacturer, Special Order items are not eligible for refund or exchange. What does "R" or "Ready-to-Assemble (RTA)" mean? Ready-to-assemble furniture is also known as knock-down furniture or flat pack furniture. It's a type of furniture that requires customer assembly. When you see a wrench on our website's product details pages, you'll know that the product will require assembly by you. Although our delivery teams don't build ready-to-assemble furniture, our installation teams do. Call 1-888-933-8786 to arrange your installation and assembly services. Check our Installation and Assembly page for full details. Why is my purchase back ordered? A product is back ordered when there is a high volume of orders for an item, manufacturer delays or if a product is temporarily out of stock. You can still purchase back ordered items and you'll be added to the queue of customers waiting to receive the product once it becomes available. Back orders are often unpredictable, and this is why availability dates are estimates which may change based on different circumstances. In cases of manufacturer delays, for example, The Brick doesn't control when a product is available. We will do our best to keep you informed of expected shipment dates and estimated dates of arrival. Do all washing machines come with water hoses? Some manufacturers supply hot and cold water hoses with new washing machines and some don't. Your sales consultant can help you find this information for specific models, or you can look up the model number (located under the item name and price on the product details pages of our website) on the manufacturer's website to view the full product specifications. What are the environmental and recycling fees I see on my total? The Brick charges environmental handling fees on certain electronics shipped to, delivered or picked up in provinces and territories where we are required to do so by law. This environmental handling fee reflects the applicable provincial rate and appears on your checkout page. All fees and surcharges must be paid in full at the time of purchase and are not eligible for "Do Not Pay," "No GST/PST" and other promotional discounts. Visit your provincial government website for more information on the specific environmental program your province provides. How do I get a copy of my receipt or sales order? Your order may be in one of these statuses. We are waiting for stock to arrive from the manufacturer before we can confirm your order. We will contact you as soon as there's product available to fulfill your order. There is product available to fulfill your order, but we haven't yet confirmed your pick up or delivery date. The product is being shipped to your selected location for pick up and we'll call you when it arrives. The product is being prepared for the selected delivery date and you'll receive your delivery time window the day before your scheduled delivery. If you'd like specific details on the status of your order, please contact your service store. Do you have any ideas on how to style your products in my home? Absolutely. Check our blog for style inspiration, how-to guides and more. What is factory distressing on furniture? Is it normal to see cuts, a rough edge or nail holes on some products? Several furniture manufacturers use "distressing techniques" to give your wood products a rustic, heirloom look. Like rips in designer jeans or the beauty marks of a fashion model, these "flaws" give each piece their own unique character. How do I add an extended warranty to my product? An extended warranty can be added during the purchase process in store or online. Or if you've already completed an online order and decided you want to add a warranty, you can visit a Brick store to purchase a warranty up to 30 days after receiving your product. You can add a warranty to a product during the first step of the online checkout process. When you check out, you'll be asked if you want to add a warranty to each eligible product. You can either select "Protect All Products" at the top of the warranty section, or specify which level of coverage you want for each individual product. When you have selected the preferred warranty for your item(s), click the "Continue" button in the lower right corner of the page to continue with the checkout process. Check our Warranties and Protection Plans page for full details or discuss your options with a sales consultant in your local Brick store. Why do I need to enter my postal code when shopping on your website? Since product availability and promotions differ from region to region, knowing your postal code helps us to provide you with the most accurate product availability and pricing. Plus, the Store Locator uses your postal code to find your nearest Brick location when checking out. You can enter your postal code at the top of our website. If you haven't entered your postal code, you'll notice our product prices are crossed out. Since many of our product prices are based on region, you need to select "Check Local Price" and enter your postal code to see accurate pricing for your location. How do I know what items are in stock? On each product details page, you can see what's in stock by looking at the delivery and pick-up dates listed underneath the item name and price. If the date is a couple days in the future, this means the product is in stock in our warehouse and ready to be picked up or delivered. If the date is further into the future than a few days, the date you see is the estimated arrival date of the next shipment we expect to fill your order, and you can expect to receive your item(s) after this date. Delayed availability dates may occur for Special Order items and products that are temporarily out of stock. Product availability can change at any time depending on the number of items in stock and the volume of other customers purchasing the same product. If you have additional questions about stock and availability, please contact your local Brick store. Why are there products on your website that are out of stock? The Brick carries a large inventory of products, and not all products will be in stock in all regions at the same time. Different pick-up and delivery dates are available based on the product, its availability and your region. To see the most accurate availability for your region, please enter your postal code at the top of our website. You can see an approximate availability date on the product details page under the item name and price. For more specific details, please contact your nearest Brick store. Why are products available on The Brick's website but not in my local Brick store? Because Brick stores vary in size and each store has a different floor plan, it's not always possible to have all of our products featured in store. We have thousands of products available online, and we do our best to showcase them and provide as much information as possible to help you make an informed buying decision. Where can I send questions that aren't answered on your product details pages? We do our best to give you as much information about our products as we can, but sometimes our website may not have the answer you're looking for. If we missed something, or you have a question or suggestion, please contact us. Can I pick up my online order instead of having it delivered? All online orders can be picked up at your local Brick Distribution Centre or at select Brick stores. Select the "Choose your pick-up date" option in the delivery section of the checkout process, and then select the store location and date you'd like to pick up your order. At the pick-up location, we'll ask to verify your full name and see valid, government-issued photo ID confirming your identity before the order is released. For remote locations, additional shipping charges may apply. Can I view and track my online order? Yes, but first you need to create a Brick online account before placing your order. Then you'll be able to see your wish list, online order history, online order number, processed payments and the status of your account. You'll receive an email with your order summary and estimated product availability date shortly after making your purchase online. The estimated product availability date is based on payment verification, product availability and delivery schedules. Delays in any of these areas may cause your order to be postponed. Didn't receive this email? Contact us. Once your payment information is verified, we'll send you an email letting you know we're in the process of scheduling your for pick up or delivery. Or if there is a delay for any reason, we'll let you know what's happening. In this stage, products are being shipped from the manufacturer to a Brick distribution centre, and then sent to Brick store if needed. This may take anywhere from a few days to several weeks based on whether the products are in stock or if they are Special Order items. Your order will be available for pick up on the date noted in your verification email, unless we've contacted you otherwise. The pick-up address is also noted on your verification email, but you can check our Store Locator for Brick locations and store hours. In most areas, we'll call you the day before your scheduled delivery date to provide you with a three-hour window you can expect your order to arrive. Track your order status the day of your delivery using Find My Delivery. Check our Shipping and Delivery page for full details. You can pay online using your Brick Visa Desjardin Card, AMEX, MasterCard or Visa. If you want to take advantage of financing offers like "Do Not Pay," you can use your Brick Visa Desjardin Card online. Unfortunately, gift cards for The Brick are not able to be redeemed or purchased online at this time. 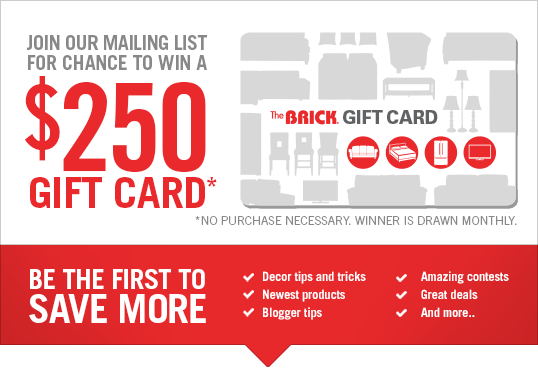 You can purchase Brick gift cards at any Brick Group store and use them in store for any furniture, electronic, appliance or mattress purchase(s). Brick gift cards may be purchased for any amount between $10 and $2,500 per card. To check your gift card balance, please contact your nearest store. Please have your gift card number available and ready when you call. Who can I talk to if I have questions about my online order? Check your order confirmation email for the name of your service store. Give the store a call and their customer service department will be happy to help you. How do I fix the "configured payment" error when trying to check out online? During the checkout process, you may experience an error in matching the billing name and address you entered with the one your credit provider has on file. This occasionally happens if you recently changed your address and haven't yet updated it with your credit provider. You can re-try your order after updating your billing information or confirming your credit card information with your credit provider. If that didn't solve the issue, please contact us. How do I sign up to receive emails from The Brick? Visit our website and enter your email address in the grey box at the bottom of the home page. Then click "Subscribe" to start receiving emails from The Brick. How do I change what types of emails I receive from The Brick? Click the "Change My Preferences" link at the bottom of any of our emails to update your email preferences. How do I unsubscribe from emails sent by The Brick? We're sorry to see you go. Click the "Unsubscribe" link at the bottom of any of our emails to stop receiving emails from The Brick. By unsubscribing, you'll no longer receive information about deals, style inspiration, tips and DIY, new products or contests. Where does The Brick deliver? Our Premium Delivery Service is available in most areas. For areas not served by The Brick's delivery team, we contract third-party courier and shipping companies. Some products can also be shipped via Canada Post's Xpresspost service. The Brick does not currently deliver or ship to anywhere in the United States, and online transactions from American customers cannot be accepted at this time. Is Premium Delivery Service available in rural areas? Because of factors like time constraints and extended travel times, we can offer only our Basic Service in some smaller towns and rural areas. This means your order will be delivered to your home, placed in the room of your choice and left in its original packaging. Check our Shipping and Delivery page for full details. Can I choose a date and time for my delivery? You can select a delivery date with your sales consultant in store or through our checkout process online. This date depends both on stock and delivery truck availability. An exact time can't be selected since our automatic routing system assigns delivery windows based on the most efficient service route. To help you plan your day, an automated dialer service (available in most markets) will contact you the evening prior to your scheduled delivery day to provide a three-hour time window for your delivery. If you provided us an email address then we'll also send you an email with your estimated delivery window and a link to our online delivery tracker, Find My Delivery. In smaller markets, our delivery drivers will contact you directly on the day of your delivery to provide a three-hour time window for your delivery. Since our delivery teams move a high volume of product every day, we're unable to change your delivery time window once it is routed by our system. Because shipping and delivery may vary based on your location, check our Shipping and Delivery page or contact your service store (noted on your invoice or confirmation email) for full details. Can I cancel or change my delivery date or time? If you need to cancel your delivery, we ask that you please contact your service store (noted on your invoice or confirmation email) at least 48 hours prior to your scheduled delivery date. However, we know that urgent situations do happen. So if your delivery has been confirmed and you need to cancel within the 48-hour window, please contact your service store and they will reschedule your delivery to the next available date in your area. However, we're unable to change your delivery time window once our trucks have been scheduled for the day. Your delivery time is generated by an automated process that considers geographical location and the number of deliveries in the area. Since multiple customers are scheduled to receive deliveries on the same day, we're unable to change your delivery time. Please contact your service store if you have any more questions. In most major markets, you can track your delivery status on the day of your delivery using Find My Delivery. Simply enter your order number and your telephone number to start tracking. This service may not be available in smaller markets. Please contact your service store for questions about your delivery. Do I need to show photo ID to the delivery team? Yes. We always want to make sure you're getting the products you ordered so the name on the order must match the government-issued photo ID of the person receiving the delivery. Will I get a receipt after my delivery is complete? No. Our delivery staff and contracted carriers refer to an order form to provide the delivery service you selected. You will receive a copy of your order and payment confirmation at the time of sale in store and online. If you'd like a duplicate copy of your receipt, please contact a customer service team member at the store noted on your invoice. I picked up my product, brought it home and found out it's damaged. Why does The Brick ask for a delivery fee to bring a replacement? For customers who opted to pick up their order, we will re-order the damaged or defective product for you. If you'd like us to bring you a new product and remove the damaged item, we ask for a delivery service charge since we need to send a truck to your home. Once your new product is in stock, just drop off the damaged product at the same time you pick up your replacement, and at the same location you originally picked up your order. When you choose our Premium Delivery Service, we take ownership of the product and the transportation of the item. If you choose our delivery service, we'll bring you a new product and remove the damaged item for you at no additional cost. The Brick uses Xpresspost by Canada Post to ship smaller items around the country. These orders are picked up by Canada Post from one of our distribution centres and will usually arrive at your home within two to four business days. Some restrictions apply. If you have any questions about Xpresspost, please contact us. If you are unable to sign for the delivery of your Xpresspost order, the courier will leave a notification card letting you know how to obtain your package. We can ship a maximum of two items via Xpresspost at one time. If you order more than two eligible items or your order contains both Xpresspost and non-Xpresspost items, The Brick will ship your order using an alternate courier company. I chose to pick up my order, but now I want delivery. Can I change this after payment? Yes. Please contact your service store (noted on your invoice or confirmation email) and they will add the appropriate fee and schedule your delivery based on what service is available in your area. I selected delivery but would rather pick up the order myself. Can I get a refund for the delivery fee I paid? Yes. Please contact your service store (noted on your invoice or confirmation email) and they will be happy to help you out. Can I pick up my purchase the same day I order it? You can pick up your purchase on the same day you order it when you make a purchase in a Brick store and the product is available at the same location. In some metropolitan areas, you can also pick up your purchase from your local distribution centre on the same day you order it if the items are in stock at that distribution centre. For customers located outside of these metropolitan areas, we will ship in-stock items from our distribution centres to the store of your choice on the next available truck. In some cases, The Brick is waiting for products from our suppliers to arrive in our distribution centres. Once received in our distribution centre, the items will be shipped to the store for you to pick up. We will notify you when your order is ready to be picked up at the store of your choice. Do I need photo ID to pick up my order at a store or distribution centre? Yes. We always want to make sure you're getting the products you ordered, so the name on the order must match the government-issued photo ID of the person picking up the product(s). I live in a very remote area of Canada. What are my options for shipping and delivery? The Brick uses Xpresspost by Canada Post to ship smaller items around the country. These orders are picked up by Canada Post from one of our distribution centres and will usually arrive at your home within two to four business days. Some restrictions apply. For larger items or any questions regarding remote area pick up or delivery, we recommend contacting your local Brick store as they will be more familiar with the shipping and delivery services available in your area. Will The Brick remove and dispose of my old furniture, mattresses, appliances or electronics? We'll remove your old mattress and boxspring when you buy a new mattress and boxspring set from The Brick. Before we remove your old mattress and boxspring, you'll need to place them in bags, which are available at all Brick stores and from our delivery teams. Some conditions apply. We remove old appliances for free on a one-for-one basis during the delivery process. This is a free service offered through our Appliance Plus+ program. Please ensure your old appliances are empty and disconnected prior to the delivery of your new ones. Some conditions apply. We don't remove old furniture or electronics at this time. Check with your local Habitat for Humanity Restore Outlet for information on donating used furniture. Electronics can be recycled at Brick Distribution Centres in some provinces, or at your local eco station or specialized waste disposal centre. Check our Removal and Recycling page for full details. Can I arrange installation and assembly for the same time as my delivery? No. However our delivery teams install and assemble some products right at the time of delivery when you select our Premium Delivery Service. Check our Shipping and Delivery page for full details. Some appliances, flat-pack products and customer assembly products require professional installation and assembly. Before your order is delivered, we can arrange for your product to be built or installed as early as one day after delivery is complete. Installation and assembly fees apply. Check our Installation and Assembly page for full details. Will the delivery team build my flat pack or customer assembly products? Due to time and travel constraints, any customer assembly products marked "R" on your invoice will not be built by the delivery team. However, this service is offered by our installation and assembly team. Check our Shipping and Delivery page and Installation and Assembly page for full details. Will The Brick's delivery team hook up my washer and dryer if I purchase the Premium Delivery Service? If you purchased new water hoses and a CSA-approved venting kit (from The Brick or another retailer), our Premium Delivery Service team will hook up your new washer and dryer at the time of delivery. Please ensure your old appliances are empty and disconnected prior to the delivery of your new ones. Some conditions apply. Due to safety requirements, our delivery team won't be able to hook up your new laundry pair if these items weren't purchased. Our staff at any Brick store will be happy to help you ensure you have everything you need prior to your purchase and check whether our Premium Delivery Service is available in your area. Some conditions apply. Check our Shipping and Delivery page for full details. What installation and assembly services does The Brick offer? We're proud to offer professionally licensed installation and assembly services at competitive prices. We install a variety of appliances and electronics, and offer a range of furniture assembly services. Check our Installation and Assembly page for full details. How much do installation and assembly services cost? Prices are determined by the area in which our services are required and the products you need help with. We're proud to offer professionally licensed installation and assembly services at competitive prices in many communities across Canada. Check our Installation and Assembly page for full details. How do I book installation and assembly services? When you've purchased an installation or assembly service, we call you. After your product is picked up or delivered, our team will contact you to arrange the requested service(s). To find out if installation and assembly services are available in your area, request an estimate or get more information about our services, contact your local Brick store, call us at 1-888-933-8786 or email our team at installations@thebrick.com. Will you build my flat pack or customer assembly product in my home? Yes, our installation and assembly team will build customer assembly products marked "R" on your invoice. Contact our team at 1-888-933-8786 and they will help find the service that works for you. Check our Installation and Assembly page for full details. Our return policy differs based on the item you purchase. Check our Satisfaction Guarantee page for full details. I found a lower price on an item I purchased last week. Do you have a price guarantee? Absolutely. If you find the same brand and model currently advertised at a lower price by The Brick or a competitor within 30 days of pick up or delivery, then we'll refund you the difference. Some conditions apply. Check our Price Guarantee page for full details. Why would you need me to try my new Brick mattress for 21 days before I can request a reselection? Adjusting to a new mattress set can take time. The less support your old mattress provided, the longer this may take. For this reason, we ask that you sleep on your new mattress set for 21 days prior to reselecting. If after 21 days you are still not happy with your choice, simply contact us and we will be happy to assist you. What do you do with my personal information when I make a purchase or subscribe to your email list? Yes. You may cancel your order at the service store noted on your invoice or confirmation email. Purchases made online and in store are refundable at any time prior to product delivery or pick up. Refunds are made only to the same credit or debit card used to pay for the order. Cash payments will be refunded to a debit card or via cheque and mailed to the person who paid for the order. Deposits on Special Order items are non-refundable after the product is shipped from the manufacturer. Can I get my deposit refunded in cash if I paid in cash? Unfortunately, not every Brick store will have enough cash on hand or the exact dollar amount required to refund your deposit in cash. We're happy to refund cash payments to a debit card, or via a cheque made out to the individual listed on the invoice. I bought a Full Circle Warranty and am ready to redeem my Full Circle Credit. How do I start? Remember to apply for the credit within 90 days of your warranty's expiry date, so visit your local Brick store and we'll be happy to help you out. We'll get your new mattress, furniture item or accessory purchase (minimum $400 purchase value) started, and the credit will be applied once our warranty company verifies it. Why buy an appliance at The Brick? Good question! When you buy an appliance at The Brick, you get so much more than a great product. With our Appliance Plus program, you can be confident you're getting the best price, service and warranty in the market. Check our Appliance Plus page for more details. Does The Brick honour manufacturer warranties on the products they sell? All of the products sold by The Brick carry a one-year warranty against manufacturers' defects, which is usually provided by the manufacturer. In cases where the manufacturer doesn't provide a one-year warranty, The Brick will provide one. Check our Manufacturer Warranties page for full details. Does The Brick offer extended warranties on mattresses? An additional warranty isn't needed with a mattress purchase since the manufacturer provides a warranty. We will assist you with your warranty claim, but the manufacturer is responsible for and has the final decision as to whether a product is defective under their warranty conditions. Does The Brick offer extended warranties on furniture? Yes, The Brick's Blanket Five-Year Furniture Plan can be added to almost any furniture purchase and covers most construction and craftsmanship defects that may occur. An extended warranty can be added during the purchase process in store or online. You can also purchase a warranty up to 30 days after receiving your product if you change your mind. Check our Warranties and Protection Plans page for full details. Does The Brick offer extended warranties on appliances and electronics? Yes, The Brick's Protection Plus Plan can be added to almost any appliance or electronic purchase and covers a broad range of repair costs. An extended warranty can be added during the purchase process in store or online. You can also purchase a warranty up to 30 days after receiving your product if you change your mind. Check our Warranties and Protection Plans page for full details. An extended warranty can be added during the purchase process in store or online. You can also purchase a warranty up to 30 days after receiving your product if you change your mind. When do I need to contact you by if my purchase is damaged or missing parts? We understand damages can occur during pick up, shipping or delivery. Contact your service store (noted on your invoice or confirmation email) within three days of your pick up or delivery date and we'll be happy to help you. Can I arrange for service or repairs for my appliances and electronics if I didn't purchase my product through The Brick? Yes. Our service company is authorized to service over 40 appliance and electronics brands. This same service is available to Brick customers whose product is in the manufacturer warranty period or for those who purchased The Brick's extended warranty. Please call us at 1-888-930-6396 or contact your local Brick store for full details. I need service on a furniture product I bought from The Brick. Where do I start? Whether you're asking for service under the manufacturer's warranty or The Brick's extended warranty plan, we're here to help. Contact the store where you made your purchase or the service store noted on your invoice or confirmation email, and one of our team members will be happy to help you. All furniture related issues can be addressed at our Brick stores and, in most cases, a service technician can be dispatched if your product is covered under warranty. Who do I contact if I'm having problems with my mattress? The manufacturer is responsible for the warranty on new mattress sales, and we can help guide you through the process to make it as simple as possible. In most urban areas, a service technician can be dispatched to evaluate the issue you're experiencing. Sometimes the manufacturer requires you to fill out forms, and we're happy to help you with that too. Although we're able to help you with mattress warranty claims, the manufacturer is responsible for and has the final decision as to whether a product is defective under their warranty conditions. Please contact your nearest Brick store for any questions about your mattress warranty. Why do I need to contact the manufacturer when my appliance or electronics product needs service within the first year? Appliance and electronics manufacturers provide a comprehensive warranty to ensure your product is maintained to the industry standard during the first year after you purchased the item. The manufacturers have immediate access to parts and updated information that may impact the performance of your product. In some cases, we have a service relationship with manufacturers, so you can contact us for help in arranging service. In other cases, you'll have to work directly with the manufacturer. In June 2018, Flexiti Financial Inc. acquired the Canadian private-label credit card portfolio of TD Financing Services Inc. As a result of this acquisition, your Brick Card Platinum account has been assigned to Flexiti. I don’t have a card from Flexiti. Will I be receiving one? Most customers will be receiving their FlexitiCard in the mail in the coming months. In the meantime, you can use your TD Card (ie. your account number) to make purchases through the Flexiti App in store. Can I use my The Brick gift card online? Gift cards can be used in any of The Brick stores however, at this time we do not accept gift cards on our website. Can I manage my Brick Visa Desjardins account online? If you're an existing customer, you can manage your Brick Visa Desjardins Card account online by visiting our Financing page. Can I pay the balance of my Brick Visa Desjardins Card using my Visa, MasterCard or AMEX? No. The balance on your Brick Visa Desjardins Card can be paid only with debit or cash at your local Brick store. The Brick doesn't accept cheques, but you can mail your cheque directly to the address on your credit card statement. You can also pay your Brick Visa Desjardins Card balance online. Check our Financing page for full details. Who do I contact with questions about my Brick Visa Desjardins Card? For questions about your Brick Visa Desjardins Card, please contact 1-800-363-3380. Check our Financing page for more information about managing your account and applying for a Brick Visa Desjardins Card. What will happen to my existing Brick Card Platinum account balance? Your balance is now owing on your Flexiti account. To ensure your payments are received on a timely basis, you will need to submit your payments to Flexiti. A simple and quick way to pay your Flexiti account by your scheduled due date is through your bank’s online banking bill payment system. Simply add Flexiti (Flexiti Financial) as a payee. You can also send a cheque to the address below – make sure you include your account number on the cheque to avoid delays. Please note that forwarding a cheque as payment may take longer to process. Your account number (TD Card or FlexitiCard Number) can also be found at the top left corner of the first page of your statement. Will the Insurance I purchased still be valid? Yes, if you are enrolled and are paying premiums, you will remain covered for your Flexiti account balances. Do I have to pay off my existing balance right away, or can I continue to make regular monthly payments? You can continue to make regular monthly payments. Remember that you must pay at least the minimum payment as set out in your monthly statement. Will I continue to receive statements? Yes, Flexiti will issue statements for your Flexiti account. Can I still view my account on-line? Once you have activated your account, you can log in to your account using your TD card or FlexitiCard number at my.flexiti.com to view your statements, including your previous TD Financing Services statements, your account balance, when your payments are due and information about your promotional plan, including your annual interest rate. Who can I call if I have any questions about my account statement or balances? You can call the Flexiti Customer Service Line at 1-877-259-3745. How does The Brick's price guarantee work? Will The Brick pick up my old products? Still have questions? Please contact us by email or call a Brick store for an immediate response.